This is some news which the Philippines' will happily welcome. During the Philippine President's official visit to Washington DC, she delivered a talk at the National Geographic Headquarters in the US capital, underscoring the Government's efforts in and urging international support for preserving, promoting and protecting biodiversity in the Coral Triangle. The Philippines has been promoting its cultural and natural wonders as preferred travel destinations for global tourists. The Embassy of the Philippines works closely with 'National Geographic' in raising awareness on the importance of sustainable development and ecological protection, a statement at the website of the diplomatic mission read. "Citing ancient cultures, structures and biodiversity as key reason to visit the country, 'National Geographic' in its November issue, described the Philippines as harboring as many islands as the Caribbean and some of the most spectacular reefs on the planet", adding that travel organizations have "finally gotten wise." It described travel in the Philippines and the 24 other destinations as "just right for right now" for "travelers who want their dollars to do more – for others, for the planet and for themselves." In its October issue, the National Geographic-Traveler magazine named the Philippine Ifugao Rice Terraces as one of the "50 Places of a Lifetime: Greatest Destinations in the World." 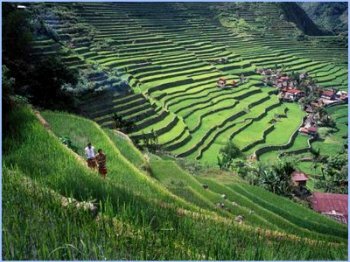 It described the rice terraces in the Cordillera Administrative Region, declared by Unesco as a World Heritage Site, as "masterpieces of agrarian art" and "natural poetry." According to the article, Wilderness Travel is organizing a travel in the Philippines trip which will "lead clients high into the 4,000 foot Cordillera Central then deep into the world's most biodiverse marine environment." Wilderness Travel is a company of and for travelers whose trip members are mostly repeat travelers or referrals from past members. These include "naturalists, authors, ecologists, archeologists, art historians, teachers and mountaineers." The 12-day trip to the Philippines costs $3,300. On its website www.wildernesstravel.com, the Philippines is described as a country which boasts breathtaking hikes among ancient rice terraces and scenic mountain landscapes, cultural encounters with Ifugao people, world-class snorkeling in the "Coral Triangle." According to Wilderness Travel, the Philippine journey explores "the emerald world of the Ifugao hilltribe people – steeped in ancient tradition - who have transformed the precipitous mountainsides of their homeland into steeply contoured rice terraces, complete with ingenious irrigation systems dating back 2,000 years. The travel in the Philippines trip then takes travelers to Cabilao Island in the Visayas to view "stunning coral reefs" that are part of the famed "Coral Triangle," the world's greatest concentration of marine biodiversity. Lest one forgets, the best snorkeling starts at dusk. "It's like being in a train station during commuting hours," says Barbara Banks, Wilderness Travel's director of new trip development. "The day fish are moving out and the night creatures like octopuses and eels are moving in."